Alone at Ninety Foot has surprised a lot of people since its 1999 publication. A first book by an unknown author, with an odd title that didn't sound like a typical young adult novel, it won the Canadian Library Association's Young Adult Book Award for 1999 as well as the 2000 Violet Downey Book Award from the National Chapter of the IODE. Also named a "Best Book" by The American Library Association, the book has been received favorably by the critics. Most surprised by all the attention, perhaps, is its author. "I never expected it." Kathy says. "To be honest, I didn't even know about these awards. This is all very new to me." But as she will tell you, Alone at Ninety Foot had a somewhat unusual genesis. "Actually, I didn't know what I was writing when I started Alone. I didn't start it as a novel; I started it as a short story. When I sat down to write what eventually became Alone, basically I was exploring the character and Lynn Canyon Park, a place that I love. I was more or less playing with the feelings and emotions surrounding it. I didn't know what this girl's problem was when I started it. It just fell into place after the end of the first chapter, but the original story was a short story. It's very difficult to write a good short story, however, and I've discovered that I need a whole novel to develop characters." Born in Toronto, Kathy grew up in King City and Orangeville, rural towns in Ontario. "We moved to Vancouver when I was 15 and was just finishing Grade 10. After I completed high school, I didn't say, `I'm going to become a writer.' I wanted to be a psychologist, and so I took psychology at Simon Fraser. However, my husband, Jeff, was a couple of years ahead of me in university, and, after he finished his degree, we got married and moved to Medicine Hat where he got his first newspaper job, working for the Medicine Hat News. I worked as a supervisor in the city day care, and we were there for two years. Then Jeff got on with the Edmonton Journal, and I became a stay-at-home mom when our first son was born." "After both my sons were in school, I took the library and information management program at Grant MacEwan College. I've been a library tech for nine years. I work for the Edmonton Public School Board at Centre High School which is in downtown Edmonton. It's a unique school in that it's only for returning grade 12's between the ages of 18 and 20. The expectation is that students complete high school in three years at their district schools. Most of these kids haven't met that criteria although some have and are there to pick up courses needed to get into specific post-secondary programs. The school has a very different concept, and I really like it because the entire staff is very encouraging and supportive, and, for the most part, the kids are very motivated." "I'm asked the question, `What got you into writing?' all the time. And the answer is that there's not one thing that got me to writing. I think it's probably just the whole creative process and the idea that we all need something creative in our life or some type of a challenge. Writing just suited me and is what I like to do. I started off with a novel, but not Alone at Ninety Foot; one that's in a drawer that nobody's ever going to see. Actually there were four, all adult, in different genres until I guess I clicked on the right one. The first novel is what might be called, or at least I was trying for, `literary.' The second one was also another `literary' one, but I scrapped it pretty quickly. The third one was more of a mystery story, and the last one was a romance. Then I started on Alone." "I sent the first couple of chapters of one of my manuscripts out and received a pretty positive reaction from a small publisher in Toronto. He asked for the whole thing, but then he said that, while he really liked the writing, he didn't feel that the story, itself, would have the audience. But that little bit of positive response is why I kept working away at writing. That was about 12 years ago, and, at that point, my kids were starting school, and so I could write a couple of hours during the day." "I think I've had a real advantage in having my husband in the newspaper business because he's been very helpful as far as feedback. When we were going to university, I would read everything he was reading; we'd always do a lot of discussing, and so I think that back and forth has always been there which has been great." Nonetheless, Kathy has discovered that having a resident editor can have its down side. "Sometimes his pre-editing has been almost a little bit too much because newspaper writing is so different. His term is: `If in doubt, cut it out.' Sometimes he'll just slash things, and I'll have to say, `No, no, no. You're not taking all that out.' He doesn't edit so much now as he just offers me feedback after reading a first draft." "I began Alone in the fall of `97 and finished it in January of `98. It went pretty fast, but I think it was a story that had probably been sitting there for a long time that I didn't `know,' and so it just came all together. I sent it to Orca, knowing that they published children's lit and west coast material, and the finished book really stands almost the way that I sent it in. There was some tightening up of a few of the chapters and a few of the scenes. I rewrote the first couple of pages many times. The last two chapters are just about as they originally came out. The manuscript didn't have dated entries to begin with. That was something the publisher wanted. I think that they wanted a more definite time line, and that was one way of defining it. I hadn't put the dates in purposely because I felt that it would read as a diary, and I didn't want it to read that way." 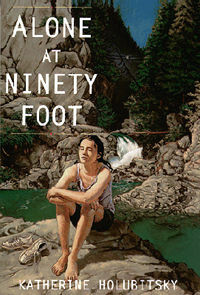 Alone at Ninety Foot utilizes a form of literary counterpoint in its style. For example, the book begins in the singular with the 14-year-old central character saying, "My name is Pamela Mary Collins," and concludes in the plural with Pam's self-affirmation: "You and me are going to do it. You and me. We will." Lynn Canyon, where much of the action occurs, is both a place of life and a place of death. There, a daughter emotionally seeks to find her "lost" mother while another mother physically searches for her Grade two daughter who went missing during a school field trip. Kathy says she was most conscious of these linked contrasts. "I had just read Emily Carr's Journals, and there's a lot of that in it. Besides, that's the way the world is, everything constantly moving, dying, And, too, I think maybe it's something I've come to terms with in my `old' age. I really enjoy being in the natural environment, and this was something I wanted to put across in the book. There have been a lot of y/a novels written dealing with saving the environment and that kind of thing, but I wanted to put a little bit more into it by showing the spiritual relationship you can have with the environment. I think that when there's an emotional attachment, respect is inherent with anything. So, that's partially why I did it. Growing up in a rural community, I was in the woods all the time as a kid. My grandparents had a farm just outside of Grand Valley in Ontario, and I spent a lot of time on that farm. Consequently, I think my writing's just an extension of that spiritual and emotional satisfaction of relating to and being close to nature. I really didn't like Alberta when we first moved here. I had a hard time when we were in Medicine Hat. It was a real culture shock, and I missed the trees of B.C. and wooded areas of Ontario so much. But I quickly realized that every place has its own beauty." Pam tells the reader that "Ninety Foot is this natural pool in Lynn Creek which runs though Lynn Canyon. It is called that because of the sheer rock walls that rise ninety feet high on either side of it." (p. 2). Kathy acknowledges that there is a family connection to this locale because "my husband grew up in that area. It was his back yard. I lived at the bottom of Mount Seymour which is about five miles away." "I don't know for sure why I made Pam 14, but I had a very good girl friend at 14 whose mother died of cancer. I just remember the emotions of that age. I remember everything about being 14 as opposed to being 12 or 13. It's also a transition year in school." In the story, Pam emotionally connects with an Emily Carr painting, "Mountain Forest." Kathy describes why Carr was included. "I think that Emily Carr just reflects that whole B.C. area perfectly. It's also the character, too. Emily Carr was such an independent woman, and her going off into the forest on her own for months at a time, well, at that time in the '20s, it was just about not heard of. I think Pam relates to Emily's independence as well as the whole idea of her art." Readers learn that Pam's widowed father Ken had already twice unsuccessfully attempted to re-enter the dating world; however, the plot offers the new possibility of Pam's gaining a stepmother in the form of Jennifer Reid, a 40-year-old spinster banker. Given the stereotypic image of stepmothers, Kathy realized that "I had to find a way of making Jennifer really likeable because a lot of stepmothers are rejected right away, which Pam does initially." The means by which Kathy made the potential stepmother more sympathetic was "given" to her by a teacher she knows. Kathy explains, "One day, he phoned me in immediate need of a book for a class. When I found it for him and said, `I'll bring it down to you,' he replied, �That's swell.' And I thought, `That's it. Anybody in this day and age who says, "That's swell," they have to mean it.' So I thought, `Using terms like that would not only really date Jennifer, but, on the other hand, it would make her really likable. How could you not like somebody that says, "Swell?"' So that's how Jennifer's speech pattern evolved. I was searching for a way to make Jennifer somebody that you would still really like but quite removed from Pam's mother, a different type of person." Having worked in schools for a decade, Kathy is acutely aware of the nuances and niceties of its culture. One of these details emerges in a scene in which Pam and two of her friends are "standing...on the steps after school. There are disgusting blobs of gob all over the steps." (p. 23) Says Kathy, "I hate that when I go to schools. I'm always afraid I'm going to step in it." Despite Kathy's intimate connection to schools, she says that "the story, itself, is entirely fictional, but you have to use people that you know to draw from. There's nobody that I can say, `Oh, that's that person.' The events are completely fictional. The only thing probably is the fact that my own mother died when I was eight, and so the emotion is there. That's what I drew on for that. Bits of overheard conversation, a word here or there will just get me thinking. As for events, maybe I heard it somewhere, but there was no intentional use, except for the one event where Danny gets up on the table with the glasses. We had a kid in the library who did something like that. He didn't actually jump up on the table, but he was just being a real goof. Yes, the school in Alone was very multicultural, but that just reflects the realities of today's schools. Because it's set in Vancouver with its Asian population, I tended to lean a little bit more with those characters. The book that I'm writing now is set in southern Alberta, and so there are different characters to reflect that geographical area." Pam's school is truly populated by the full range of adolescent "characters" that one would find in most typical Canadian junior highs. One of the more colorful individuals is Danielle Higgins of the "perfect body" whom Pam describes as someone "who uses people like Kleenex, then tosses them aside when she is finished with them."(p. 14) About Danielle, Kathy says, "She's my cliche character. She's in every school, and when my sister read the book, she said, `I sat across from "Danielle" all through Grade 8, and I was so glad that she got it in the end.' Danielle is someone we all knew, and, of course, she's everything you're not. Her male equivalent for boys is probably the 'jock.'" At one point in the story, Pam is suddenly and briefly groped on the street by a young male pedestrian. Kathy explains her reasons for including the scene. "I think some type of assault like that happens to almost every girl. I put it in to make girls aware that that kind of thing happens even if it hasn't happened yet. It may not be an assault; it may be just be an unwanted advance of some type. I've had a few mothers with young daughters of about 10 say that they would have had their daughters read Alone except for that one scene. They were afraid that it would scare them, and they didn't feel they were ready for that reality." In the main, readers have responded positively to Alone. "I've gotten some nice feedback. The letter I really liked was from a girl in Ontario. She said that when she read the first chapter, she started to cry because the character was so much like her that she just couldn't believe it. I think I started to cry when I read that because it was just so well put and so honest. I received a letter from a woman who was taking the book in a young adult literature class at McGill, and she said that she'd never read anything that had affected her so profoundly. It turned out that her father had died two years prior to her reading the book, and so I have a feeling that that was probably why it really did have an effect on her. I had one man tell me that he had three daughters and wished he had read Alone before his girls had become teenagers as it would have saved a lot of heartache because he would have understood them better. I had another man say that he wished that I'd gone into the dad more. It was a nice thing for him to say because obviously he was enough into the father that he thought I should have gone into the character more. However, if I'd tried to do that, it would have been a different book. " 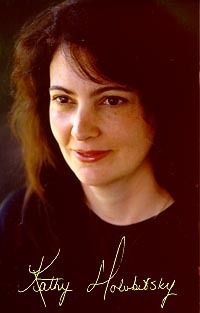 In assessing her approach to her craft, Kathy allows, "I'm a disciplined writer because I have to be. Since I work as well, I only have so much time that I can actually spend writing, and so I pretty much stick to it. In the 2000-01 school year, I'm going to be working only part time, just until one in the afternoon. Though afternoons are not my prime thinking time, I'm really looking forward to that change because I've found that it's really tough to make the time. I have the option to go back full time when I want. During the regular year, I don't write before I go to work. I write in the evening, and I don't set a goal for each day. I will say I'm going to redo a certain conversation, and I'll start off doing that, and then I'll continue on from wherever I left off. I won't persist if it's not working. One day I may write one page and another day six pages. I can't tell myself that I'm going to write five pages because I don't know if that five pages is going to be good or not. I don't write right through and then go back and change things. I don't move on until I'm relatively happy with what I've said. I'll work on a sentence or a paragraph or whatever until I really like it and it's saying what I want it to say, and then I will move on. I know some writers get the story down quickly and then go back, but I can't work that way." As noted earlier, Kathy has moved east with the setting of her next YA novel. "Again a coming-of-age story, it's set in southern Alberta in the fictional town of Agatha which is based a lot on Medicine Hat. Many small southern Alberta towns are named after women, and so that's why I named it Agatha. The story follows a girl who comes from Vancouver to live with her aunt and uncle who are both veterinarians and have a clinic in Agatha. The story occurs over the summer and deals with the group of kids she gets involved with. One of the boys, the one with whom she becomes romantically linked, is dealing with a problem which escalates until eventually he's out of control." Called "Last Summer in Agatha," the book has a more male perspective than Alone, but it's told through the girl's eyes. �The reason I chose that perspective and transplanted her was because, growing up in a small town, I know that the kids who lived there eventually just wanted out. I wanted the setting to have a charm as well so that again I could bring the natural environment into play. When you grow up in a place, you don't notice that so much, and so that's why I used that technique. I really had a hard time going from Pamela's voice to this girl's voice because she is more than a year older. It was hard not to take on a lot of the same qualities in the voice. It's told in the first person, and I did that so she could relate the whole story, as well as have personal contact with the different characters." And the best news for fans of Kathy's work is that "a third YA novel is `in the works.'" Alone at Ninety Foot. Orca, 1999. Grades 7 and up. *This article is based on an interview conducted in Edmonton, AB, on July 25, 2000.